The first pharmacies to complete pharmacy licence renewals under the new requirements were those whose licences expired on June 30, 2018. In the first few months since the implementation of the new pharmacy ownership requirements, the College has received a number of questions regarding how these new requirements fit within the College’s licensure process. Q: Can I submit my Annual Report or Notice of Articles, instead of a BC Company Summary, as part of my Pharmacy Renewal Application? What is the difference between these documents? A: No. The College requires the most current BC Company Summary document which lists the directors & officers of a corporation. Annual Reports only list the officers of a Company, while a Notice of Articles will only list the directors of a Company. These documents do not allow the College to verify the most current information about the Direct Owner. Q: What is a Central Securities Register and how do I obtain one? A: A company must maintain a Central Securities Register (CSR) in accordance with the requirements in the Business Corporations Act. This document lists the shareholders within the corporation. You can obtain this document from either the lawyer or law firm who incorporated your company, or from the individual who is responsible for maintaining this document within your corporation. This document must be certified by a lawyer or notary before being submitted to the College. Q: I’ve submitted my Register of Directors, is this the same thing as the Central Securities Register? A: No. The Register of Directors only lists the directors and officers of a corporation. The Central Securities Register lists the shareholders of a corporation which is what the College requires in order to validate the names of indirect owners. Q: I’ve submitted my documents and have completed my Attestation on eServices. 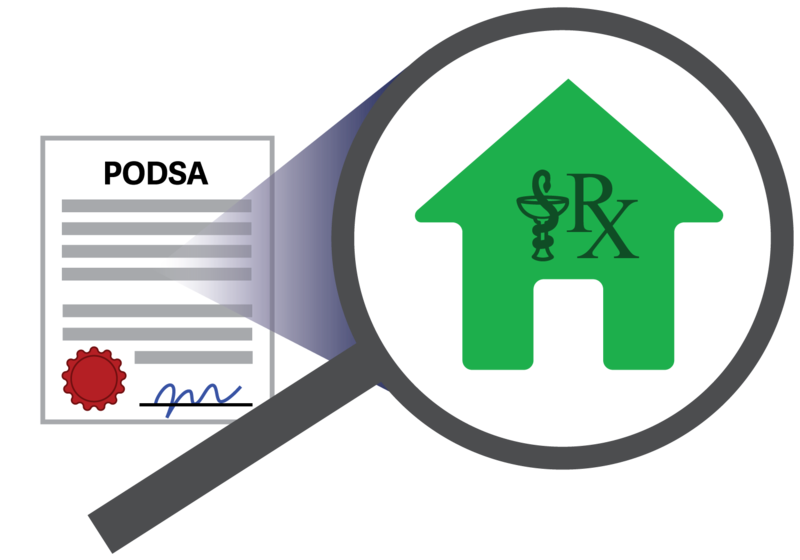 How can I track the status of my Pharmacy Renewal Application? Is there a way for me to see which of my indirect owners has not submitted a requirement? A: Only the authorized representative(s) of a pharmacy are able see a detailed view of which indirect owners have submitted their Attestation or Criminal Record History (CRH). To see your licence renewal status, log into eServices and go to ‘My Pharmacies.’ Scroll down and expand the list of pharmacies by clicking on the ‘+’ sign to the left of the Direct Owner’s name. (Note that clicking the Direct Owner’s name will take you Ownership Portal.) Once you have expanded the list of pharmacies owned by that Direct Owner, scroll down the list to find the pharmacy due for renewal. This initial list view will give you a summary of statuses for the pharmacy’s Attestation, CRH, Business Licence and payment. To view the detailed list of indirect owners, click on the ‘Pending’ link under the Renewal Complete column. This detailed list will display all of the indirect owners and whether or not they have submitted their Attestation and/or CRH. This list does not divulge the eligibility or status of the Attestation and CRH. Q: I am an indirect owner of a pharmacy and have submitted my Attestation and Criminal Record History. How can I check to make sure I’ve completed my Proof of Eligibility? A: Indirect owners can contact the authorized representative of the Direct Owner to confirm their Attestation and CRH have been submitted. Alternatively, indirect owners may contact the Licensure Department via email to confirm they have completed their Proof of Eligibility. Please note: the Licensure Department will not disclose the eligibility status of indirect owners. Q: Who is responsible for uploading the business licence for a pharmacy renewal application, and how do I upload one? A: The business licence can be uploaded to the Pharmacy Portal 75 days prior to licence expiry by the authorized representative OR the pharmacy manager. To access the pharmacy portal, log into eServices, go to ‘My Pharmacies’ and scroll to the bottom of the page. At this point, you may have one of two views depending on your role(s). If you are an authorized representative, you will see the name of the Direct Owner with a ‘+’ sign next to their hyperlinked name. Click the ‘+’ sign to expand the list of pharmacies owned by that Direct Owner. Find the pharmacy due for renewal and click on the hyperlinked pharmacy name to access the pharmacy portal. Once you are in the pharmacy portal, review the pharmacy information on each tab and click ‘next’ to advance to the ‘business licence’ tab where you can upload the business licence. Once you have uploaded the document, the file name and upload date will be updated. If you are a pharmacy manager, you will only be able to see the pharmacy portal. Click on ‘my pharmacies’ and scroll to find the pharmacy that you are a manager of. Click on the pharmacy’s name to access the pharmacy portal. Once you are in the pharmacy portal, review the pharmacy information on each tab and click ‘next’ to advance to the ‘business licence’ tab where you can upload the business licence. Once you have uploaded the document, the file name and upload date will be updated. Q: My pharmacy is due for renewal later in the year, however I want to start preparing to meet the new PODSA requirements in advance. What can I prepare ahead of time? Can I complete my Criminal Record History (CRH) before my pharmacy is due for renewal? "Preparing for Pharmacy Licence Renewals during the Transition Period"
"Submitting Pharmacy Licence Renewal Requirements"
"How to begin preparing for your pharmacy licence renewal under the new PODSA Requirements"
In-person appointments can be arranged by emailing licensure@bcpharmacist.org. The Criminal record History (CRH) is completed through our third party vendor Sterling Talent Solutions and can only be completed once you’ve received notification from the College. The College will receive results directly from Sterling Talent Solutions and this may take up to 7 days. Q: I have completed my CRH with Sterling Talent Solutions using instructions provided by the College. How do I share my results with the College? A: The CRH must be completed by following the instructions provided to you by the College and the results will be sent directly from Sterling Talent Solutions to the College. Although you may have received your results, it can take up to 7 days for the College to receive the result. Q: What happens if I do not submit all of the requirements by the renewal deadline (30 days before the pharmacy licence expires)? A: Failure to submit all of the requirements: payment, ownership information, Proof of Eligibility (attestation & CRH) from each indirect owner, and a valid business licence* will result in your Pharmacy Licence Renewal Application being referred to the Application Committee for review. Q: I am a registrant with the College and have completed a Criminal Record Check (CRC) during my registration renewal. Why do I have to submit a Criminal Record History? What is the difference between the two checks? A: All registered pharmacists and pharmacy technicians are required under section 20(3) of the Health Professions Act to undergo a Criminal Record Check (CRC) through the Criminal Records Review Program (CRRP) under the Criminal Records Review Act (CRRA). This is conducted at the time of initial registration and at least once every 5 years thereafter at the time of registration renewal. This check does not provide the comprehensive Criminal Record History required under the Pharmacy Operations and Drug Scheduling Act. Additionally, the Criminal Records Review Program is specific to registrants and does not provide a means to conduct a Criminal Record History of a non-registrant. The College cannot use the Criminal Record Check result from the Criminal Records Review Program for the pharmacy licensing process as it does not meet the Criminal Record History requirement under the Pharmacy Operations and Drug Scheduling Act. As such, all direct and indirect owners and managers must submit a Criminal Record History as part of the licensure process. All direct and indirect owners who are registered pharmacists as well as managers must also continue to undergo the separate Criminal Record Check process to maintain their registration with the College.